The form of these beakers is a rare variant, being more broadly based and with sharply upswept, angular handles. This form presumably pre-dates the more common two handles beakers that went into production, and with the crisply moulded acanthus leaves which are similar to those found on Böttger stoneware suggests an early date. 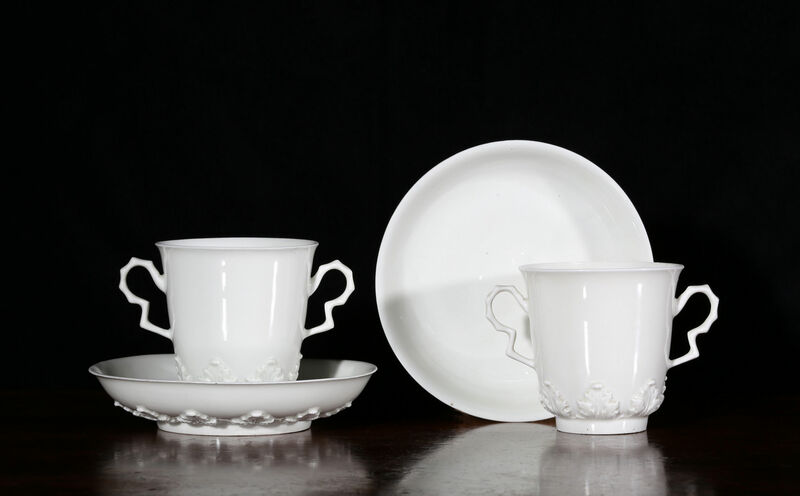 Although Böttger porcelain was successfully made from 1709 it only went into commercial production around 1713, when it is recorded as being sold at the Leipzig fairs for the first time. In the excitement of the creation of these early porcelains, they were generally left undecorated. These are amongst the earliest pieces produced commercially. Condition – Very minute rim chips to edge of one saucer.